Before I was born, my dad was in the National Guard. Years before I knew him, my husband was in the Marine Corps. But it wasn’t until my younger sister joined the service that I understood what it meant to be part of a military family. When my sister joined the United States Army, we didn’t know what that meant for our family; when we would see her again, if she would be home for Christmas, how the experience would affect her. Like most military families, we experienced a void during the holidays, tears at the airport and fear of deployment. While there is definitely fear and sadness associated with having a loved one in the military, there’s also a huge sense of pride. On family day of her graduation weekend I watched my sister and her fellow soldiers march out of the woods through a cloud of smoke while patriotic music played in the background. I was overwhelmed with pride and gratitude — for my sister, the military, my country — and all of the families that sat around me were experiencing the same feelings. 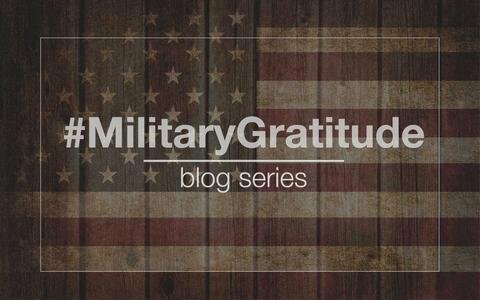 I’m grateful that my sister found her home in the military, a place she felt she belonged. I can see the difference this experience has made in her life, and how she feels a part of something bigger than herself. It takes a lot to walk away from everything you’ve ever known into something so unexpected and unpredictable. I am grateful for all of the men and women in our service who have the bravery and strength to put their lives on the line to fight for what they believe in. A thank you seems insufficient given the sacrifices many have made in being away from their families and their homes, many even giving their lives. Operation Gratitude is close to my heart because it gives us the opportunity to let our military heroes know we appreciate them and we’re thinking of them.